The pro-evolution Clergy Letter Project boasts the signatures of over 12,400 ministers who affirm that evolution is true while the 1st eleven chapters of Genesis are “teaching stories” that are not historically true yet convey meaning, rather like Aesop’s fables. These ministers have compromised the clear teaching of the Word of God in favor of the fallible word of men in lab coats who weren’t there, don’t know everything and, sadly, have a statistical tendency to be anyagonistic toward God and supernatural rvelation. They have made this compromise of their own free will and, in doing so, they will answer at the judgment Seat of Christ for surrendering the authority of the revealed Word of a perfect God, thereby casting a stumbling block in front of our little ones [who statistically reject religious truth wholesale when they’re taught evolution and millions of years as scientific fact]. But what of the founder of the Clergy Letter? What are his motives? What does he believe and what does that say about the pro-evolution, anti-revelation Letter they’ve signed their names to? In short, why did he create the Letter to begin with? The Clergy Letter Project began in 2004 as a reaction against the Grantsburg Wisconsin school board’s proposal that “all theories of origins” be taught in all schools districts. Thanks to Michael Zimmerman’s actions, which initially only garnered less than 200 signatures, Grantsburg settled for a proposal that science educators teach both evolution’s “strengths and weaknesses.” Zimmerman hailed it as a victory for science education. By the end of 2005, he attracted a little over 10,000 clergy signatures affirming evolution as scientific fact and surrendering the Biblical Creation account, Adam & Eve and Noah and the Ark as mere Bible Stories that teach in the tradition of Aesop’s fables, but are not factual histories. Since 2006, he’s also promoted the celebration of Evolution Sundays by local congregations. Bam! That’s what the whole thing is about. An attempt to undercut the argument that by only teaching evolution in a rosy Pollyanna fashion while not mentioning alternatives specifically because they imply a supernatural Creator you’re effectively indoctrinating children in practical atheism. Public schools become little humanist factories. Zimmerman hopes to use this Letter to whitewash the issue. He wants us to suppose that public schools teaching evolution by purely natural processes without the need for a God will produce the sort of compromising convictions of the God-used-evolution crowd. It won’t. Because God isn’t even a part of that equation. And people like Dr. Zimmerman aim to keep it that way. Through initiatives like the one in Grantsburg and websites like TeachThemScience.org, which is co-sponsored by the antireligious Center For Inquiry, he’s fighting to make sure that kids are indoctrinated in a one-sided rosy portrayal of evolution as uncontested scientific fact. P:oint in fact, TeachThem Science.org opposed the “strengths and weaknesses” wording that Zimmerman hailed as a victory way back in Grantsburg. Each time, he dissembled that it wasn’t about him. His refusal to give me a straight answer made me think the obvious: He’s got something to hide. Logically, admitting he was a Christian or even a religious adherent of another faith couldn’t really hurt him. Oh, we might accuse him of being a mainline liberal Christian, given his views, but we could accuse him of no more. “the one who tells me that one can be a Darwinist and a Christian too. But, most of the time, he isn’t a Christian himself, though he is definitely a Darwinist. Oh yes, there are a few Christian poster boys, who don’t matter much in a group where 78% are pure naturalists. “I think you’re just using these misguided, misinformed clergy for your own purposes, to undermine the Creationist position and, ultimately, Biblical authority. Now, think about it, guys. Here’s an atheist telling us that religion and evolution are perfectly compatible, but he hasn’t got any real stake in the religion side of the equation. If he can find people he can use to seemingly defuse the argument that teaching evolution in public schools impinges on somebody’s religious rights. He [and so-called science advocacy groups, aka evolution enforcement groups] can use it to try to convince judges, school boards and the public-at-large that there’s no real conflict between religion and evolution – it’s just a religious fringe element. You see, lots of Christians who don’t really believe their Bibles have no problem with evolution. It’s those few orthodox Bible-believing wingnuts who are making an issue of this thing. A guy who doesn’t believe in God, who can’t even get his head around how someone could, but believes in godless evolution, creates a movement to oppose all attempts to teach evolution critically and objectively or to even mention alternative theories, especially any that mention God as having a role [or even an existence]. Why is he recruiting people who believe in God again? As a means to an ends. Zimmerman [by way of Eugenie Scott] has figured out that one clergyman is worth two scientists at a school board meeting. And if he can get these patsies to help him promote evolution in an environment that excludes a combined discussion of evolution and religion to the exclusion of religion, he will succeed in maintaining a public education system that amounts to a taxpayer-funded atheist factory. Don’t don’t buy the bull. Zimmerman’s not trying to elevate the conversation. He’s not trying to demonstrate that evolution and religion are compatible. He’s throwing up a smokescreen of compromisers to delude school boards into thinking that teaching evolution will not affect the religious adherence of the youth they’re teaching when it’s statistically demonstrable that kids who are taught evolution as scientific fact largely go on to reject religious truth wholesale. His interest in religion is purely mercenary. A means to an ends. Sure you can be religious and believe in evolution too! You can trust atheist Michael Zimmerman on this one! 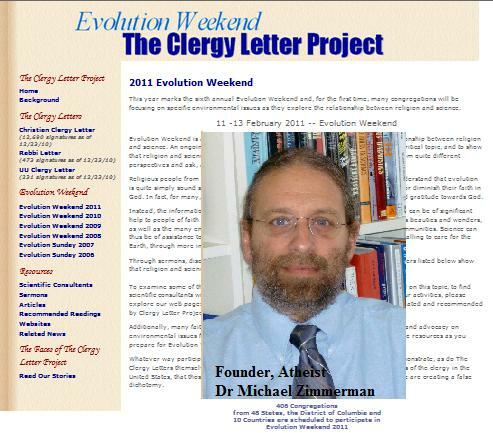 Or you can be one of the growing number of Christians and clergymen who affirm the authority and historical veracity of the Word of God from the very first word by adding your signature to the Creation Letter here at CreationLetter.com, the Biblical Creationist response to Zimmerman’s pro-evolution Clergy Letter. Make your stand for truth today! I know there are dark forces like this out there. I deal with them on the blogsphere. But it still seems amazing to me what lengths these people will go to in order to press an agenda of “anti-belief”. Its a real contradiction and frankly that’s the amazing part. Thanks for the comment and the incredibly useful quote. It’s amazing that my polar opposite can see the matter as clearly as I, but those who would compromise do not see that their “neutral ground” is merely the No Man’s Land between two armed camps. Yet they ask us to set up camp there with them. Or to quote the Bible, the cry, Peace, peace, when there is no peace.